Well, here she is again. NOS Mosrite from 1987. I’m still speechless. No wonder I have hundreds of guitars from every decade except the 1980’s. What more could I possibly get? This baby needs her own page. Well, I have a few other 1980’s guitars, so perhaps a whole row instead of a full page. Yes, front row. Here you go. Can I get you anything else, Sweetheart? Popcorn? Licorice? Please, enjoy the show. 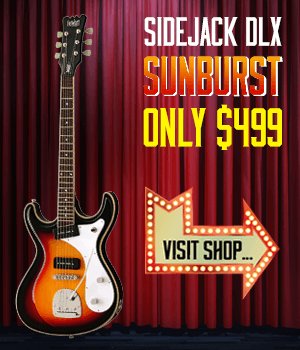 Below: OK, so here we have some non-Mosrites for you. First up, Aria Set Neck double cutaway. This guitar has many charateristics of the 80’s guitars. Switchable humbuckers with their own little toggle. This was a common theme. Set Neck for sustain matched with a variety of tone controls though multiple pickups and wiring configurations. If you did not play a synthesisor or disco, then you played solo guitar. Set neck, tone controls. That fits the bill. Similar in the Lotus. Set neck with a variety of tone controls. The other issue in the eighties was the post-lawsuit guitars. “If we can’t copy Gibson and Fender, what the hell are we going to do?” Next to the Lotus are a couple of Washburn Eagles that were brought to my attention from a visitor to this page, John Trentes from Cleveland, Ohio. It seems that the Lotus is a copy (and a pretty damn good one at that!) of the late 1970’s Washburn Eagle (that is John’s Eagle next to the Lotus). I found a picture of another one in the ABBA Museum in Stockholm. The only difference is the Washburn Eagle has some nifty push/pull pots for switching to single coil mode where the Lotus added some mini-toggle switches. 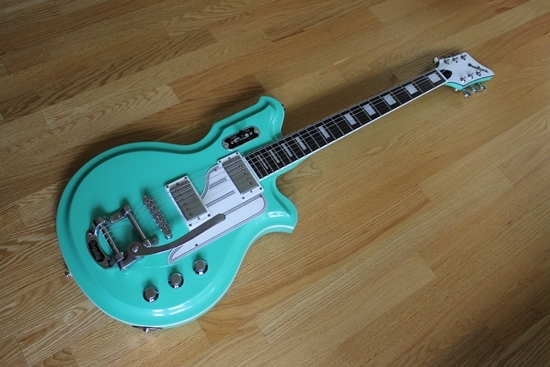 One of these days I’ll need to get some Mother of Pearl and fix my guitar up with the ABBA neck inserts…. Right. Thanks John! Beautiful Washbourne Eagle! Why oh why did I sell mine!!! I have an electric 6 string Takamine GX-100TB & case. It is from the 80’s and is in mint condition. How much would it be worth? Dan cameron it would be worth around 400-500, depending on how patient you are and wether or not it comes with a case. You should Join the takamine solidbody enthusiast page on facebook for more info, i made it a while back to find out info on them and answer questions just like yours!